This is a Blog Series on the Women of Destiny Conference, Cruise to the Bahamas, which will be continuing throughout this week. Click here for Blog Series Part 1 – The Invitation. When you have said yes to God to fulfill your great destiny, the enemy Satan immediately tries to hinder or stop you. After Ray said he thought I should do it and after I prayed and God told me to accept Tony Robinson’s invitation to speak at the Women of Destiny conference on the cruise to the Bahamas, I had to immediately prepare with prayer regarding my fears, the costs, and the message. We had to have faith for this trip. God would have to provide the finances for this if I was going to go. We live off of Ray’s paramedic salary and my speaking/writing/coaching business which just started a year ago. As I shared in yesterday’s post, my cruise fare would be covered by Well Watered Woman Ministries, but I’d need provision for my hotel stays, the air fare from Kansas City, MO to Miami, FL and back, and spending money. I also needed to pray to hear what God wanted me to speak about at the conference. 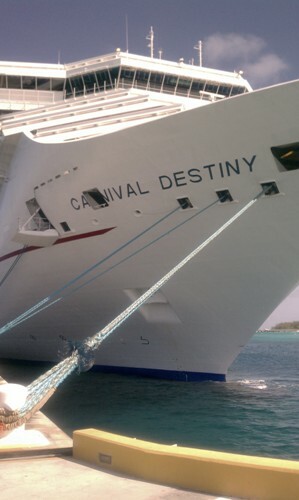 I immediately felt that the name of the cruise ship, Carnival Destiny, and the conference name, Women of Destiny, was significant and prophetic. God’s Spirit would be hovering over this ship and the waters that we were going through. He wanted revival on the entire ship and in the Bahamas, and He would use us women at the conference to do it! I spoke about this and on the great destiny God has for women. God has an incredible purpose and destiny for your life. Do you know what that purpose and calling is? If you ask God, He will show you. If you need a coach to help guide you in the process of discovering and living out your purpose, you can find out more about my coaching services by clicking here. Ray has always wanted to go on a cruise to the Bahamas and wanted to go on the cruise with me. Tony was also praying for her husband and four children to go with her on this cruise. We prayed for months in faith for God to make a way where there was no way. The provision came in miraculously for Tony and me to get a cabin, and Tony booked us as “temporary roommates” until Reggie and Ray were booked. Then in January 2012, Ray worked some overtime at work, so I was able to book my roundtrip flight. Right before I left, my precious sister Maria – a single mother of three children – sent me a financial blessing in the mail to sow into this good soil opportunity. Initially I deposited it in the bank to book Ray’s cruise fare when a cabin opened up. When he couldn’t go, this was the provision for my spending money for my meals at the ports and for spending money for souvenirs. Our prayers were being heard! These provisions by God boosted our faith even more. Tony’s husband Reggie had prepared a great speaking presentation on not allowing the enemy to stop your destiny. Tony’s kids were planning to present workshops for youth on the cruise, and one of her daughters worked up to the last minute on her speech in child-like faith. The kids had their bags packed and ready to go. At the midnight hour, a friend of Ray’s loaned Ray the money for his cabin cost, air fare, and spending money. We had above what we needed for this cruise and were so excited! The morning I was leaving, Ray went to the airport with me when our daughter Heather took me, with a packed bag, in faith that a cabin would open up for him and Reggie to share as room mates. But we were meeting resistance. Cabins didn’t open up. The cruise was booked solid. Everyone who was to go on this ship experienced spiritual warfare. Satan did all he could to distract us, cause us fear, and stress us out before boarding this ship. He attacked our families, our emotions, and our health. The day I was leaving for the cruise, my flight was first delayed, then completely cancelled! The airline cited maintenance issues as the reason. Looking back now, I believe God was protecting me from something happening to me on the plane…but at the time, it was quite stressful. I had to choose to walk in peace when this happened, and not freak out! My cancelled flight meant that I would lose the money that I had spent on booking a hotel at in Miami that night! I prayed for God to restore this loss. When I came home from my trip, I had an email that a woman had ordered and paid for a bulk quantity of my book, The Hands Of A Woman, for a Bible study at her church. God answered my prayer before I even left! 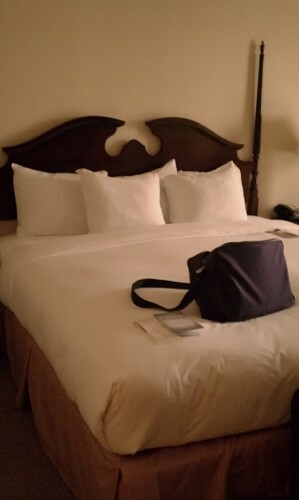 I was able to get on that standby flight the next morning, but found when I boarded the plane, that I was at the very BACK of the plane – the last seat! I asked the flight attendant if I could move closer because I was on a time crunch and she said that was the gate agent’s responsibility, who was in too much of a hurry to do anything now. Unreal. The airlines should have bumped me to first class for the inconvenience. By this time, I confess that I was irritated and tired. On top of this, the passenger beside me didn’t want to sit by the window (I had the aisle seat), and sat right next to me. Please understand, I normally LIKE people, but I just wanted to be left alone and sleep. This man would have none of that! He wanted to TALK. He asked questions, too. He was a foreigner, a short little man who spoke with broken English. I had a lot of trouble understanding him and kept having to ask him to repeat himself. You may think this is funny, but now I wonder if he was really an angel…yes, an angel who didn’t speak very good English. When he found out that I was on a time crunch to get to a ship by that afternoon (I would be flown to Atlanta first, then Miami), he went to the bathroom toward the front, and when he came out, he looked around the cabin. Then he boldly told the flight attendant that there were PLENTY of seats up front where I could move closer to the front! Thank God for intercessors! See how God uses social media for His purposes? I was able to get on that flight. When I landed in Miami, I was sprinting through the airport, texting Tony and my family on the run, LOL. In Atlanta, the flight attendant had taken my purple roller board, saying there wasn’t enough room on the plane. 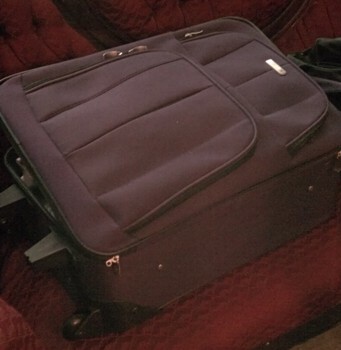 They’d go ahead and send it to my final destination, and it would be waiting with my one checked piece of luggage. I looked dubiously at my roller board being tagged and quickly wheeled away, and prayed to God it wouldn’t get lost. At least I still had my makeup, my outfit to speak in, my Bible, and the speaking presentation with me! 😀 The essentials in life! This next part is nothing but GOD! When I got to baggage claim in Miami, I went up to the man who was answering questions about baggage claim and suddenly I see this airline staff person RUNNING out with my two purple luggage pieces! This NEVER happens! You always have to wait forever for your luggage at the carousel! I think she was an angel sent by God to help me! God wanted me on that ship! I yelled, “Those are my bags!” and grabbed them from her, then ran outside in the hot Miami weather to the curbside to get a taxi. My sister thought this was hilarious. Perspiration dripped from my face and neck. Only God could get me to go somewhere hot – ON PURPOSE! There was a long line of people waiting for a cab. You couldn’t get your own taxi; you had to get in line. It was some sort of weird Miami rule. A man with a radio calling taxis got a taxi for you.I couldn’t get a very good pic of the taxis, because they sped by…. 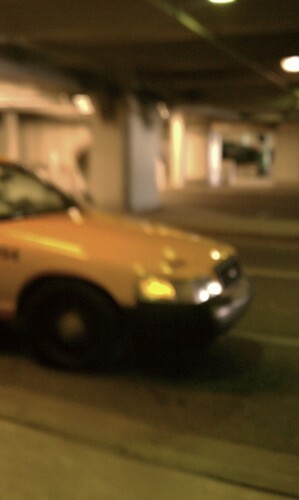 Taxi - Miami was a blur! The taxi driver that I got said that he didn’t understand English very well, but when I asked if he could give me change, he understood that! “No change!” he said. He also understood the word “Fast!” to get to the port. Miami was a blur as he sped to the port, weaving in and out of cars. Would I make it to the ship alive? By the time I arrived on the ship, I was exhausted, but exhilarated with excitement. With all I’d been through to get there, this was going to be GOOD! 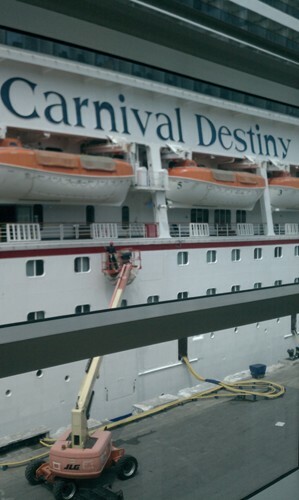 Below is a picture I snapped through some glass windows of my ship Carnival Destiny at the port in Miami. The ship was ENORMOUS! I had just gone through security, showing them my passport and my boarding ticket. From the moment, I entered Carnival Destiny’s building, I was so refreshed by their smiling faces and how they cater to your every need and desire! They truly have servant hearts! Oh, but it was worth it all to get there! Remember, it’s always hottest before the breakthrough. Keep praying and keep your eyes on Jesus. What resistance are you facing right now that is hindering or stopping you from fulfilling your great destiny? render us ineffective to be used by God. BUT GOD! The battle and the victory belong to Him! So many things happened before this conference. Tony, her ministry team, and my family and I kept pressing through in prayer. People who had said they were going to go to this conference suddenly backed out. Suddenly Tony’s other speakers who were lined up for this conference couldn’t come for reasons beyond their control. 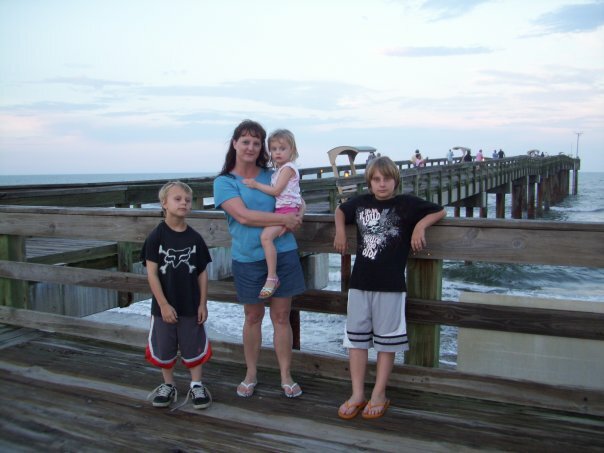 There were a few times when I began to wonder if I was going to be able to go, but I just kept praying and had faith in the word God had given me. God was sending me to the Bahamas for His glory! It was all about HIM and His kingdom purposes. For whatever reason, Ray, Reggie, and Tony’s kids weren’t able to go this time. We don’t understand why, but we have to trust that God’s will was accomplished. Tony and I are believing they will all go next time! Tomorrow, I’ll be sharing on what it was like to step onto that huge ship for the first time and showing you some pics of the ship, so stay tuned for Blog Series Part 3! WOW Beth! I am experiencing a ton of resistance from the enemy right now! I don’t quite understand why but will continue to push forward. Thank you as this is a timely message for me to hear! God Bless you my sister!